← Art is a window to the brain. 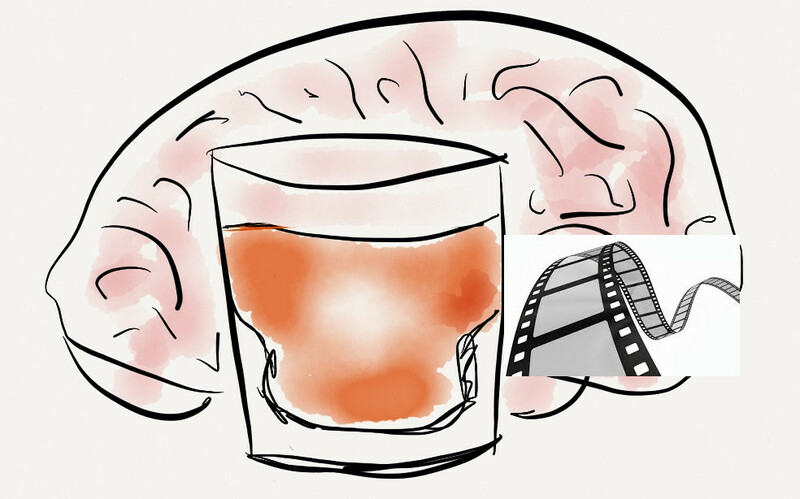 Alcohol withdrawal in movies or literature? Alcohol withdrawal syndrome presents in about 5–10% of heavy chronic addicts after one or two weeks of relative or absolute abstinence (e.g. after admission into the hospital for an unrelated illness). Its manifestations (singularly or in combination) are tremulousness, visual (usually animals, i.e. zoopsia) or auditory (usually human voices of known persons discussing in third person) hallucinosis or hallucinations, seizures (‘rum fits’), and delirium tremens. In the semiautobiographical novel Big Sur, J. Kerouac, as Jack Duluoz, battles all the withdrawal symptoms and delirium tremens, together with depression and paranoia. Delirium tremens is the most severe form of withdrawal and manifests with deep confusion, slurred speech, uninhibited behavior, staggering gait, delusions, vivid hallucinations, sleeplessness, and increased autonomic activity (fever, tachycardia, perspiration), and can even lead to stupor, coma, and death (often because of cardiac arrhythmia and respiratory failure). It seldom occurs until the abuser has been drinking heavily for at least the past ten years. The syndrome follows within a few days (until a maximum of two weeks) after stopping drinking. The mortality rate for delirium tremens improved from the last century from 37% to 2-7% of patients with the disorder due to advances in intensive care medicine. The etiology of delirium tremens is due to functional changes in the GABA neurotransmitter and NMDA receptors, which lead to unbalanced effects of excitatory transmitters. One of the best descriptions of delirium tremens in literature was given by Charles Jackson in the novel The Lost Weekend (1944), and Mark Twain gave a superb description of the disease with the alcoholic and abusive father in Huckleberry Finn. Edgar Allan Poe probably died because of delirium tremens (even if there is some controversy on this issue), calling out the name Reynolds (perhaps the explorer Jeremiah N. Reynolds) and repeating for hours ‘Lord help my poor soul’. Do you know other fictional or true characters who have been affected by alcohol withdrawal syndrome? Questa voce è stata pubblicata in Alcohol-related syndromes. Contrassegna il permalink. Una risposta a Alcohol withdrawal in movies or literature? in The Adventures of Huckleberry Finn, Pap is described having delirium tremens not from alcohol withdrawal, but from extreme alcohol consumption. Is this accurate?